Josh Marshall: "The question isn't whether Trump has business in Russia but whether Russia has business in Trump." I have no love for Vladimir Putin or Donald Trump, but this juvenile posting is below you Jerry. Gays should be angry with you over the insult. Democrats should be angry with you over the low intellect impact, and Republicans should be angry with you over the suggested lie. You owe us all an apology. Jerry...I hope you aren't holding your breath! 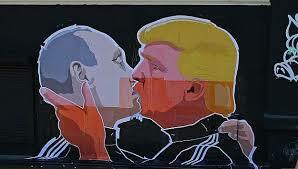 Mr. Wilson, the symbolic "kiss" between Putin and Trump isn't the worst of it. As we learned yesterday, when Trump invited the Kremlin to conduct cyber espionage against his political rival, Mr. Trump does not have the judgment nor the restraint of your average 5-year-old brat. Mr Wilson, if your tender sensibilities are offended here, perhaps you should save your admonitions and your sense of decorum for your side. It seems as though the leader of you party sets a pretty low bar when it comes to matters of etiquette and propriety. Start there. And the Trump campaign gutted GOP’s anti-Russia stance on Ukraine and said that he would look into recognizing Russia's claim to the territory. Are you insane Mr. Wilson or just another Republican prostitute? What Happens Now With Early Voting?